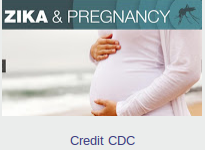 While the link between maternal Zika virus infection and an increase in congenital defects - such as microcephaly - is pretty well accepted, unknown at this time is just how big a risk that really is. We've only seen two studies on point, and they provided two very different results. In Association between Zika virus and microcephaly in French Polynesia, 2013–15: a retrospective study, researchers came up with about a 1% likelihood of microcephalic birth when the mother is infected in the first trimester. Today the NEJM carries a perspective - based on an analysis of Zika outbreaks in Bahia, Brazil - that attempts to quantify the risks based on the limited information available. But based on what they know right now, these researchers found a `strong association between the risk of microcephaly and infection risk in the first trimester and a negligible association in the second and third trimesters'. Then, depending upon which set of assumptions they used (to fill in the missing data gaps) - they came up with a range of risk that ran between .88% and 13.2% - of 1st trimester Zika infection resulting in a microcephalic birth. Since there are still major gaps in the data, and microcephaly is but one possible `grave outcome', these results need to be taken in context. Michael A. Johansson, Ph.D., Luis Mier-y-Teran-Romero, Ph.D., Jennita Reefhuis, Ph.D., Suzanne M. Gilboa, Ph.D., and Susan L. Hills, M.B., B.S.